This is a well established large range of wet food in attractive packaging with a colour photo of your dinner on the front. 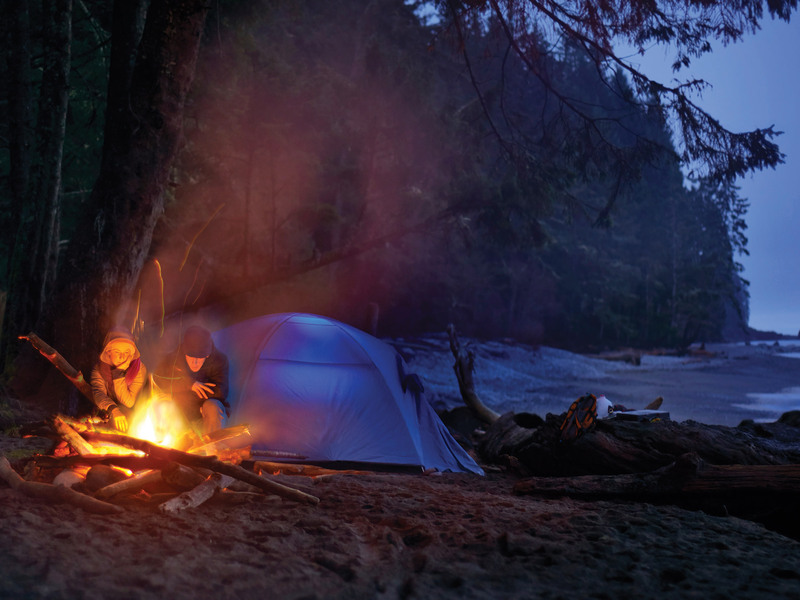 From the people who bring you Vango – they have serious outdoors credentials already. pouch does retain the heat a bit so best to leave it to cool for a bit or use your gloves – you’re outside anyway. It looks good – just like something you might make at home – with visible meat and whole kidney beans. 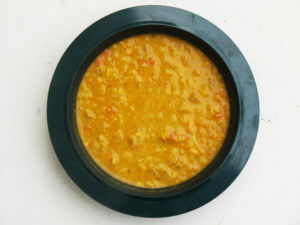 This all gives the meal a decent texture, and encourages you to chew, which of course helps you to digest. Tasty, but not too salty (2.4g for the whole meal), there is also a nice spicy kick from the cayenne and cumin sauce. There’s long grain rice in there to bulk it up, and the whole meal is pretty satisfying and tasty. 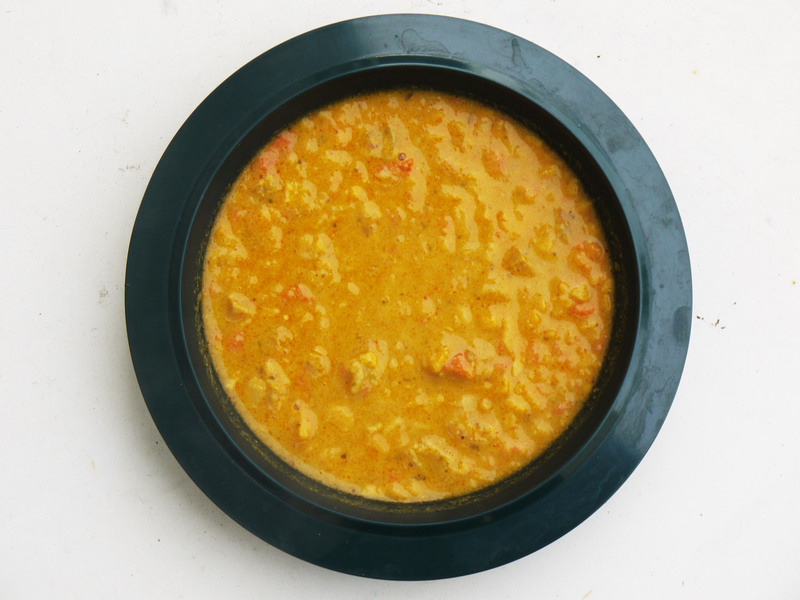 This is from a high calorie range of freeze-dried meals aimed squarely at replacing lost energy on a long hike. The packet is nice and light and you just tear open the bag and add water – boiling if you have it, but it will rehydrate with cold. It just takes longer. And probably wouldn’t taste that great. I added a bit too much water (the instructions said up to 440ml), and the end result was sloppier than I would have liked. There are fill lines on the inside of the packet if you don’t have a measuring jug. You need to seal the pack back up while you wait for the food to come to life – about eight minutes, so you need to factor in the time to boil the water and the rehydration. The meal didn’t look all that great, but that was probably due to the extra water I added. It smelled good, and had a good curry taste. The meat was a wee bit chewy, but on the whole the effect was pretty good – and actually very satisfying. 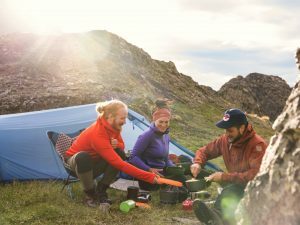 Originally developed for the Norwegian military, these freeze-dried meals are lightweight and compact. It’s a bit tricky to read the instructions as the pack seems to be shrinkwrapped around the contents. Once torn open, I added water – but there was no fill line as indicated on the instructions. I just stirred until I felt it was a decent consistency, then using the ziplock, resealed the bag and waited for around five minutes. I probably hadn’t put enough water in, as some of the contents were still powdery and dry. You can add more water at this stage, but I just mixed it all together and ate it. 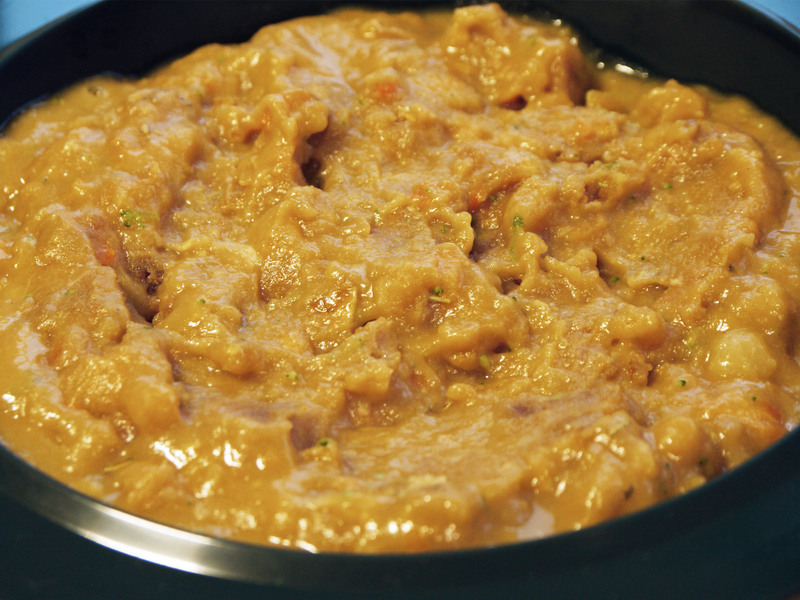 First impression was that it resembled baby food, both in colour and consistency. Very salty (4.5 per cent) and there didn’t appear to be any chunks of lamb visible. On reading the ingredients the lamb was actually lamb pate (a mixture of lamb, potato, flour and more salt). Consequently the texture was pretty dull, but the flavour was strong and overall the result was filling. 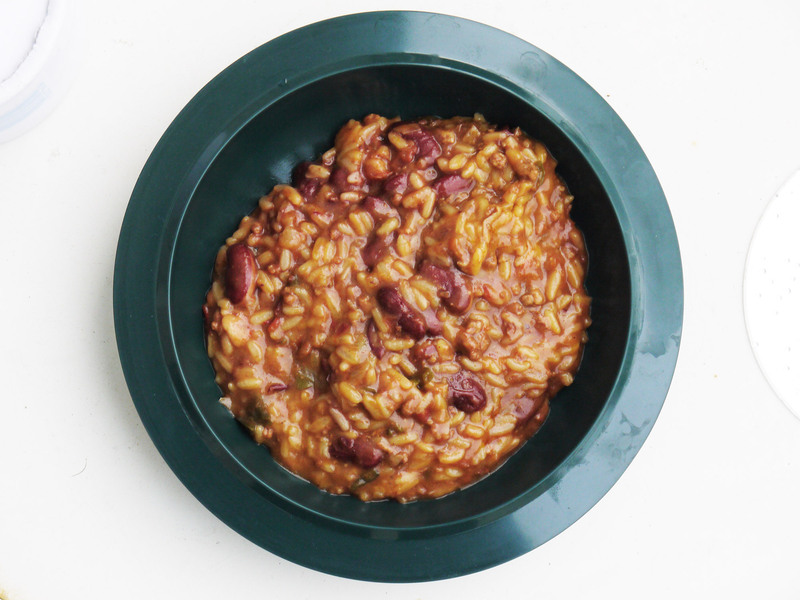 Beyond the Beaten Track (BTBT) has a large range of ready meals, including all-day ration packs for the Ministry of Defence. These packs include a breakfast, lunch and dinner (including pudding) along with some high protein snacks thrown in for good measure. 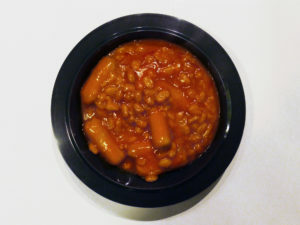 This meal is at the lower end of the culinary spectrum – sausages and beans I could probably rustle up myself without too much bother. However, there are other alternatives in the range, but they are quite predictable. Chilli con carne, meatballs and pasta, that sort of thing. But when you’re out on the hill and it’s blowing a hoolie, you really want something familiar and comforting. It’s pre-cooked wet food – so can be eaten hot or cold. There’s a cellophane wrapper (containing instructions) around the foil pouch containing the food. You can boil the bag unopened on your stove, or open the bag, decant into a pot and heat the food that way. Like some other companies, BTBT also sell self-heating food kits which contain a lightweight flameless heater. This adds another 40g to the weight of your meal, but it’s not as heavy as a stove. The heater consists of another bag with calcium oxide and sodium carbonate. 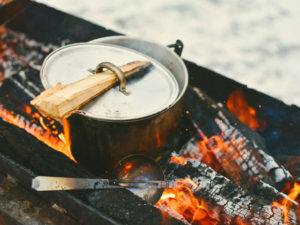 When you add water (and this can be dirty water or even urine), there is a reaction and the compound heats up – allowing you to have a hot meal without the need for a cooker. This would be a handy addition to a winter rucksack, just in case you were caught out. You should of course always take any rubbish home with you. The sausages and beans looked like something you might serve at a toddlers party – but they hit the spot. Forestia is a new range of wet foods to the UK, and are among the heaviest meals on the test, because you don’t need to add any water. It’s real food in a bag with no preservatives or artificial colour. 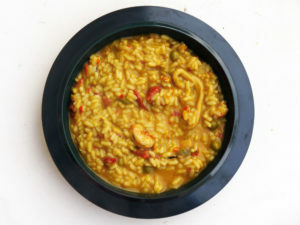 The range of meals is extensive and quite exotic – from Iberian pork cheeks in Porto wine to a few vegan options, such as green lentil curry. The packaging is attractive, with a colour photograph of the dish on the front that wouldn’t look out of place in a gourmet magazine. The pouch looks like it would take a few knocks, and stands up on its own. I boiled this meal, unopened, in enough water to cover the pouch on our camping stove. It bobbed about a bit, but after seven minutes, we felt it would be hot enough to sample. The bag is easily ripped open and you can dig straight in, or pour it into a bowl. The pouch is also microwaveable (for the caravanners and sailors among you). First impression was that it looked great – quite colourful, and not too sloppy. I could see prawns and mussels in there, but just one bit of squid. 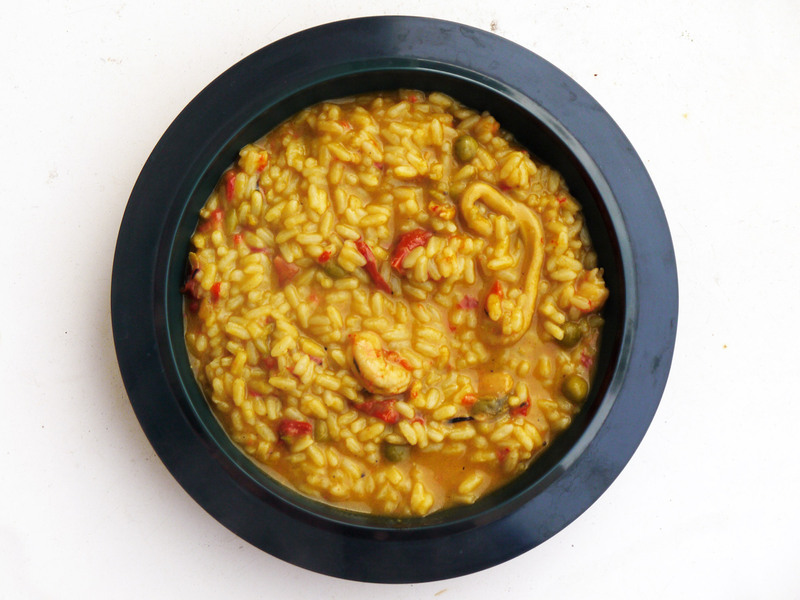 It tasted quite salty, as you’d expect from a seafood paella, however, I checked the nutritional information on the back and discovered there was 70 per cent of my daily recommended intake of salt in this single serving. When you hike long distances, you lose salt through your sweat, and this needs to be replaced – so from that point of view this ticks that box. It’s gourmet food for the outdoors – and great if you don’t want to compromise on quality when you’re away from home.